to the loved ones of patients receiving medical treatment in DeKalb County. Pay-It-Forward House provides our guests with all the comforts of home. Our guests stay in one of three bedrooms in the House and share the use of living room, kitchen, dining area, bathrooms and laundry room. We also operate a room inside of Kindred Hospital-Sycamore, which is handicapped accessible and we partner with local host-homes and hotels to accommodate all of our guests’ needs. We know that this is a very difficult time for our guests, so we have created this home with their needs in mind. Our House offers a place where our guests can get a good night’s rest and find respite in their own room, or in the comfort of the family room and the gardens. Each bedroom includes fresh bedding and towels. Other amenities include cable television, computer access, free wi-fi, complimentary laundry supplies, pantry staples and some toiletries. Our kitchen is stocked with coffee, tea, breakfast foods and snacks. You will also find a refrigerator, microwave, toaster oven, crock pot, coffee maker, bottled water and homemade cookies baked by our volunteers! Pay-It-Forward House is a healthcare hospitality house established to provide a home-away-from-home for family and friends of patients receiving medical treatment. Most of our guests are here visiting a loved one at Kindred Hospital-Sycamore, or at KishHeath System’s Kishwaukee Hospital or under the care of DeKalb County Hospice. We welcome our guests to the House to catch their breath and get some rest, whether for a few hours (free of charge) or a few weeks (at minimal expense). Our warm, friendly home-away-from-home was created to help relieve some of the stress and worry our guests might be experiencing because of their loved one’s illness. 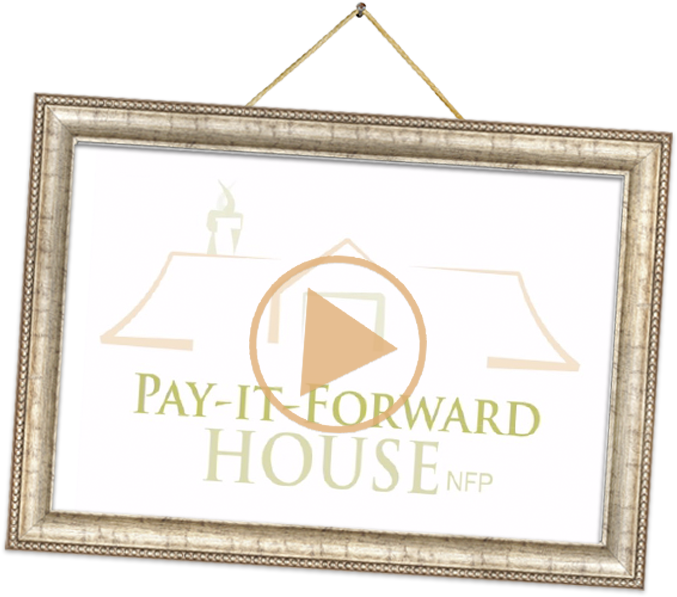 Click on the play (in the frame) to learn more about Pay-It-Forward House.